While most people are familiar with table tennis as that game you played in the basement on rainy days, the game can be a great competitive activity for all ages. As long as you have a table, a net, a few ping pong balls and a couple of paddles, you can play. Surprisingly though, there are many options for table tennis paddles, from the cheap ones that you find at the discount store all the way up to professional caliber paddles that can cost a couple of hundred dollars. So what should you be looking for when buying your own table tennis paddle? That depends on your level of experience, style of play and several other factors that we will look at, along with showing you the paddles that we think are the best. 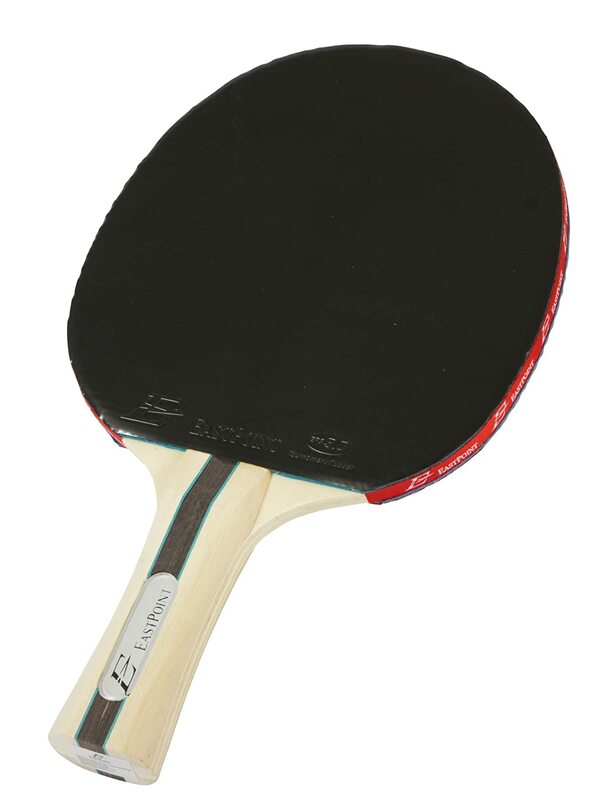 In our opinion, the best table tennis paddle on the market is the STIGA Carbon. The Swedish company has been making top of the line table tennis equipment since the end of World War II and the Carbon only furthers their reputation as a leader in the industry. This paddle is on the higher end of pre-built models in terms of cost, but there is a clear difference in response and play versus most other rackets on the market. But for that money, you are receiving a paddle that represents the forefront of technology. Even recreational players who opined on this product believed it to be a great paddle almost on par if not better than many custom-made professional paddles. The technology of the Carbon begins with the blade. Its 7-ply extra light construction incorporates two layers of carbon fiber within it to provide a strength and solidity that an otherwise lighter paddle would usually lack. These carbon layers give your shots and returns extra power and speed compared to the conventional paddle. If you prefer to play a more offensive or aggressive game, these are choices on STIGA’s part that you will enjoy with this paddle. Even with this power, the Carbon performs well as a defense or counterattacking paddle in large part because of their rubber surfaces. The rubber in the Carbon is infused with Nano Compression technology, giving it tighter bonds between molecules ensures top of the line speed and spin. But more control than most paddles made for the offensive player is created with their ACS technology, which creates many microscopic air pockets in the rubber, ensuring its grip and elasticity, giving the player more control. As well, many reviewers credited these technologies with the rubber on these paddles holding up for much longer than the average high-end paddle. Another factor in our preference of this paddle is its balance. The handle is lighter than a normal paddle and the materials are assembled in a way that moves the center of gravity on the paddle closer to the point of contact. This gives you a truer hit and more hits on the sweet spot, which also ensures more power and more control on your shots. These technologies combine to give the Carbon high marks in all three rating components of table tennis paddles. It has 99 and 100 ratings in speed and spin respectively out of 100. While these are outstanding ratings that can be matched by many offensively-aligned paddles, very few if any can match their 80 rating on control making it a great paddle that can elevate everyone’s game. The Carbon enables a more defensive player to add more offense punch to their game and the offensive player to not sacrifice defense and shot placement. Its high ratings across the board make it a great paddle for any beginning or intermediate player. If there are drawbacks to this paddle, it would be the cost. It is rather expensive and unless you are playing regularly, you might blanch at paying this much, regardless of quality. As well, at this price point, many high-level players feel they are much better served buying their own blades, rubber and foam and making their own paddles. Also, many experts pointed out that this paddle will not compensate for a player’s limitations and inexperience. Much like expensive golf clubs will not make you a good golfer, but practice will; most players will benefit more from practice and experience than they will from an expensive paddle. 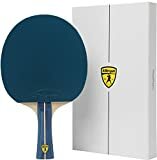 But that being said, most intermediate level players can and will see positive effects on their game from this paddle as is it clearly head and shoulders over many paddles on the market. Finally, another minor caveat with this paddle is that it is made for a shakehand or Western grip, which means that it is not made for penhold grips, but there is a similar model available for that grip. Chances are though if you know what the penhold and shakehand grips are though, you know to pay attention this before you make a purchase. Even with these concerns though, it is clear that if you want a great table tennis paddle and are not afraid to pay accordingly, the STIGA Carbon is the best choice. Our second place pick is another table tennis paddle from STIGA. The STIGA Evolution is a slight step down in comparison to the Carbon, but in its own right, it is a great paddle at a slightly friendlier price. The biggest difference between the Carbon and the Evolution is that the Evolution does not incorporate carbon fiber layers into the construction of their blade. This makes for a blade that is a little heavier and also tends to absorb force slightly more than the Carbon. In most cases, this is almost a princess and the pea situation where if you are not as experienced, you would not likely notice that much of a difference between these two paddles. One place where the Evolution does match up with the Carbon is in the composition of its rubber as well as the make up of its handle. This rubber as mentioned above is unparalleled on the market and gives the Evolution similar play components to the Carbon. One advantage though with the Evolution versus the Carbon is that while is loses a little bit of speed and power, it offers more control than the Carbon. With ratings this high, the Evolution is again a great paddle for any style of play, and is a great choice for an inexperienced player. The handle of the Evolution, much like many STIGA paddles focuses on balancing closer to the sweet spot and diffusing energy through the paddle instead of the player’s hand. This again is reflected in its outstanding ratings in control. As well, many reviewers felt that this paddle also felt great in their hands, enabling many hours of easy and comfortable table tennis play. The ratings of the Evolution only emphasize what was said above on its great all-around play capability. It rates a 96 out of 100 on speed, which reflects its power and ability to reflect shots precisely and accurately. On spin it rates as a 94, which is slightly lower than the Carbon, but this difference is minuscule at best. Finally, the Evolution rates as a very strong 90 on control, giving it control that is rarely seen on the market for a paddle that offers this much power and spin. This paddle, according to many reviewers and experts felt that this paddle again offered a nearly professional feel right off the shelf without the fussing and mussing with the Carbon. Most reviewers also mentioned that this paddle markedly enabled them to step up their game from a beginner level to an intermediate level. While again, money spent does not necessarily make for a better player, this paddle can improve your play if you are an experienced player. One issue that was reported with some frequency with reviewers was the paddle was prone to splitting much more than many other paddles. Whether this because of rough play or defective manufacturing, but to STIGA’s credit, they were more than willing to make the situation right either by reimbursement or replacement, which reflects their commitment to quality and customer satisfaction. While it is not the powerhouse paddle that the Carbon is considered, the Evolution clearly can hold its own. This makes it a great second choice in our opinion. Our third choice, the Killerspin JET200 balances lower cost in comparison to the two STIGA offerings above with quality. There is a slight step down in its ratings, but even then, the JET2000 is still as good of a paddle as you will find on the market especially for the beginner starting to look to improve their game. The biggest difference between the JET200 and the two STIGA’s above is in the construction of its blade. It only has 5 plies versus the 7 of the two above. This does affect its consistency and solidity slightly in comparison to more expensive paddles. Even then, most reviewers reported that the JET200 did perform to expectations and was generally considered carefully and well built with no reports of returns for splitting or shattering of paddles. This construction does lead to less speed on shots made with this paddle. The JET200 rates as a six out of ten, which means that it is not suited for players wanting to play an offensive or aggressive game. Inversely though, most beginners will find that this reduction in power ensures an easier go with controlling their shots. Considering that Killerspin intends this paddle to be more for beginning level players, it is a conscious and well-engineered decision. The rubber and weight of this paddle do provide a lot more spin than many other rackets at its price point. This is in part because the JET200 uses top of the line rubber on its striking surfaces, providing a grip on the ball that is usually seen more in higher priced paddles. This makes for a value that is great for those looking for an improvement in their game and equipment without spending too much money, or for players who are more focused on defensive or counterattacking play. Where the JET200 stands out in its class is in its control, rating at an eight out of ten. This can be partially attributed at least to its use of 1.8 millimeters of foam, which is more than the 1.5 found on most standard paddles. This allows the paddle, coupled with its rubber surfaces, to hold and control shots better, meaning you have better placement of your shots and control over your returns, which again benefit defensive and beginning players. There are drawbacks, not only because of its lack of power transfer on shots and returns. The JET200 is clearly intended as a paddle oriented to the beginner, both in cost and its set up. More experienced players will likely be better served with a different paddle. As well, players looking to play a more balanced or offensive game will not find this paddle performs as they would desire. Another minor issue reported is partially blamed on Killerspin’s desire to create a paddle a little more aesthetically pleasing. Some reviewers reported that the coloring, usually blue, used in the handle tended to come off during play. This was easily remedied after playing with simple soap and water, but it was a concern mentioned. Killerspin being a newer player on the table tennis scene, tends to oriented its paddles to newer and younger players. While they do not have the reputation of a STIGA, the JET200 is a great paddle for a younger or inexperienced players and great for a third choice in our opinion. Our budget pick is the the Eastpoint EPS 3.0. This paddle is a clear step down from most paddles that carry a significantly higher price point. But for its cost, the EPS 3.0 is a nice paddle that is still better than basic without a high price tag. This paddle is pretty much no frills compared to the others we have reviewed in this article. But it can be found in most discount stores and serves as a great house paddle. Many users reported that they bought these after the paddles that came with their table either broke or were otherwise found lacking. While it is not on par with the STIGA or even the Killerspin paddles on the market, the EPS 3.0 is also priced noticeably lower than any of those paddles. As far as ratings go for the EPS 3.0, it is clearly middle of the road and more of an all-around paddle. It rates a 6 out of ten for speed and spin and a 7 for control. This makes it great for the beginner or as mentioned above, when you need a few extra paddles for your table. While this paddle will not enhance your game, it will not impede it either, making it a great happy medium. Most reviewers noted that the EPS 3.0 does not hold up well over a lot of playing as those who bought these for office settings or played a lot on their own noted that rubber and sponge backing came off of the blade rather quickly. This can be fixed with some glue, but more often than not these paddles did last as long as most of the more expensive paddles on the market. But considering the price paid, it is likely that this will not be minded by the average buyer of this paddle. There is a clear delineation between the other paddles reviewed and the Eastpoint EPS 3.0 table tennis paddle. But if you are looking for a paddle or paddles that will not set you back a lot of money, between their cost, functionality and ease of finding them, this is a great budget-friendly choice. The most important consideration when buying a table tennis paddle is what your personal style is. This is because the differences in materials comprising the paddle and weight of the paddle can affect your style. Obviously, if you are just starting, you should probably use the traditional pipped rubber on both sides paddle. Once you have some experience and want to incorporate speed, spin and defense into your game play, then things can become more complex. The first thing that you need to consider is if you will want a harder paddle. Usually harder paddles will be heavier, but provide a larger sweet spot on the racket to give a truer hit, which is great for more aggressive and offensive players. As your play improves, you may not need as large of a sweet spot, allowing you a lighter and faster paddle which can give you a slight edge on reaction time, usually making it suitable for defensive play. Next, your choice of rubber and padding will need to be considered. All of the outermost rubber layer have one side that is pipped or pimpled and the other smooth, which side is facing the paddle. If the pimples are outward, that usually gives you more potential for spin when you strike the ball or better enable you to block and return better, although usually at the cost of some control as the paddle will hold the ball longer. If the smooth side is out, a player has the full range of shots at their disposal and more control over those shots. Handle type needs to be considered as well for your table tennis paddle. This factor comes down mostly to grip style and handle shape. There are two types of grips used in table tennis, one is the penhold or Asian style and the other is the shakehand or Western style. Most novice players will use the shakehand grip, but as they advance, they may find they prefer the Asian style, which requires the handle essentially be tapered away from the striking surface of the paddle. The other thing to consider with your handle is the exact shape of it, which really does not affect much beyond the feel of the paddle. It is recommended that you try out each of the three shapes to see which you prefer if you have the chance, either at the store itself or better if you can borrow a paddle from a more experienced player to see which feels best in your hand. While at first this would not seem like an issue, how long the paddle has sat on the shelf before purchase can affect its abilities. Rubber, whether natural or synthetic loses its tackiness and suppleness the longer it sits. This should not be a factor with purchases from stores where their stock is rotated often, but can mean that the paddle you buy is not as effective out of the plastic wrap as it should be. This is why many experienced players will invest in a great wooden part of the paddle, or the blade and replace the foam and rubber on the paddle on a regular basis. This not only allows them more control over the condition of the rubber, but it can allow them to cater their paddle to different conditions and situations. As well, this is why you will also see established players keeping their paddles in bags, like you would see with tennis rackets, as this extends the life of the rubber as well as protects the wood from moisture. The final factor to consider before buying a table tennis paddle would be the composition of the blade, or wooden part of the paddle. The official rules of table tennis require that the blade be at least 85% wood, with many basic paddles being entirely wood. What that other 15% is made of can make a vast difference in the performance as well as durability and cost of the paddle. Many paddles include carbon fiber, fiberglass or compressed paper, each giving a different element to how the paddle performs. Carbon fiber will make for a harder paddle, which will make it play faster. Compressed paper will be lighter, yet softer, making it sometime preferable for those playing more defensively. Finally, fiberglass creates a thicker paddle, while giving some of the weight reduction of compressed paper and some of the solidity of carbon fiber, making it the choice of either all-around players, or those who cannot afford carbon fiber paddles. As well, how exactly the wood is layered when making the paddle can change its durability, but also how the ball responds to strikes. Most paddles are three, five or seven layer paddles, with all wooden paddles usually being three layers of wood, while paddles that have non-wood components putting those between those three wooden layers, or adding another wooden layer or two. We do not have enough space to truly explain each of these variances, but expect that the more layers comprising the blade, the more expensive the paddle. With this expense can come a variety of advantages though which may require you to test or ask other players their preferences. Table tennis is not just an activity for your garage or basement. There are many clubs and tournaments around the world that allow you to experience a hobby that is not only great physical activity, but also a great way to meet new people for many years. Once you gain experience and an understanding of your playing style, most professionals and experts recommend choosing the paddles that are suited for you, rather than adjusting your style to a paddle. Even then, with our recommendations and these considerations in hand, we are sure that you can find the perfect table tennis paddle for you.